Chance is a Native American engineering student from the Pine Ridge Reservation. Chance is a Native American engineering student from the Pine Ridge Reservation. He attends an area university. We had asked Chance if he could stop by and pick up his care box from our office. He graciously obliged our request. This was quite a feat, especially as a freshman, since he was still taking finals for his classes. The American Indian Education Fund (AIEF) program’s Scholarship service is about building relationships with Native students. Building and maintaining relationships with the awarded scholarship students begin with the congratulatory award letter to those students anxiously awaiting their notice during the summer months. Once they have received that letter, a collective sigh is exhaled throughout the communities where these students live. After verifying their college and accepting the offer, AIEF keeps in touch with them throughout their academic year to check in on their progress. These progress checks are just a small piece of the communication that AIEF builds with their scholarship students. At the beginning of each academic year, AIEF sends out a college care package to every student receiving an award letter for that year. 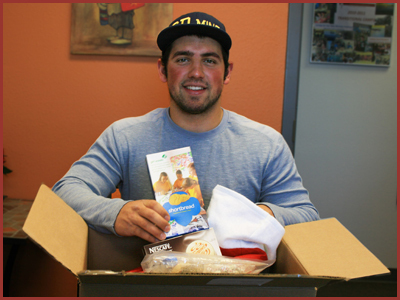 This care package lets the student know that AIEF is thinking about them during their transition as a college student. All students deserve to receive at least one box while they are attending college, but AIEF sends out two! The second one is sent during the Christmas break and again it lets the students know that AIEF is thinking about them during finals week and the Christmas holiday. Chance shared with AIEF that his biggest challenges as he faced his first semester as an engineering student were, “studying and keeping up.” This is surely expected from a freshman, and certainly an engineering student, but is an understatement when you add the category of student athlete into the mix of things! He is a linebacker for the football team and they too are in a major transition as a university athletic program. They have just completed their NCAA Division II transition and the travel out of town and state can be a bit of a challenge for a lot of students. Chance actually credits football in helping him to structure his time well, though. There really isn’t any room in his schedule for procrastination and given their travel schedule next year to Florida and Canada, he knows that learning how to prioritize his time is critical to his success in and out of the classroom. "I didn't even realize that I needed some of the stuff!" He is staying on campus this year and says that he hasn’t been bored even once since arriving. His original plans after high school were to continue the family business of ranching, but his family wanted him to obtain his education first. His sister is also attending college out of state, so it’s clear that his parents have placed a great deal of importance on education for all of their children. 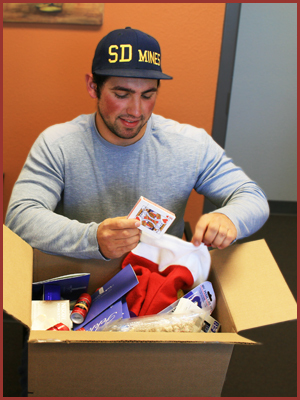 Chance was a “sport” as he opened his box with the Christmas stocking in it. He recalled getting the Care Package at the beginning of school and said, “I didn’t even realize that I needed some of the stuff!” He was very thankful for the scholarship provided by the donors who are supporting his and other Native students’ education through AIEF. He was also looking forward to finishing and paying it forward in his reservation community.